A Place for Both Technology and Makeup! As a pale person, my skin tone tends to vary throughout the year.this means that I tend to need different shades of foundation to match my skin tone. 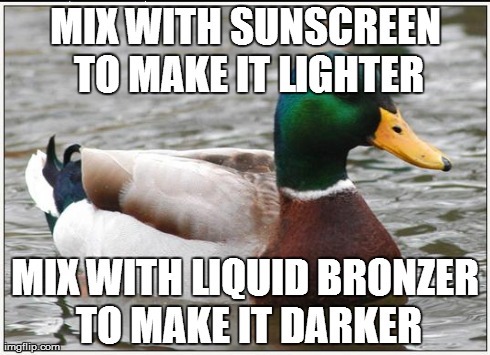 While this may not match your underlying color (you can use colored primers and mix them in for that business), this is a fantastic technique to keep you from having to purchase multiple shades of foundation! Liquid bronzers tend to be a bit more difficult to come by than powder bronzers, so if your skin is a warm hue, I recommend Giorgio Armani Liquid Summer. Cool or neutral? Go for Perricone MD No Bronzer Bronzer. This is more of tidbit of a trick, so, I hope this saves some people hassle and dollar bills!